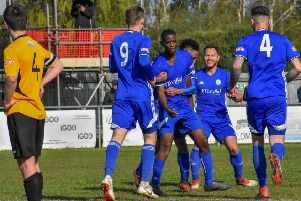 Stamford were unable to ease their relegation worries in the Evo-Stik League Northern Premier Division yesterday (April 9). The Daniels entertained promotion-chasing Salford City looking for nothing less than three points to move out of the drop zone. But they were denied by a 91st minute equaliser and had to settle for a 1-1 draw - a result that actually saw them drop a place. They are now third from bottom but just a point from safety with three games remaining. Next Saturday they travel to title-chasing Darlington 1883. Tom Batchelor put Stamford ahead on 15 minutes but the visitors finally breached a resilient backline when Luke Clark fired home in injury-time to sink Stamford’s hopes of three vital points. Spalding also drew 1-1 in Division One South at home to Chasetown after Neal Spafford had fired them in front in the fifth minute. In the UCL Premier Division, Yaxley were the only local winners. They thrashed basement visitors Huntingdon 5-1, which made it six points and nine goals since Brett Whaley returned to the helm. Dan Cotton hit a hat-trick to open up a seven-goal lead at the head of the Premier Division scorecharts and Matt Gearing got the other two Cuckoos’ goals. Huntingdon actually opened the scoring with a Luke Young goal after 17 minutes. Deeping drew 1-1 at home with title-chasing AFC Kempston. Will Bird gave them the lead on 58 minutes and Kempston levelled 15 minutes later. Fourth-placed Holbeach lost 3-2 at Kirby Muxloe after conceding three times in the first half. Jake Clitheroe made it 3-1 after 52 minutes and Josh Ford’s 24th goal of the season three minutes from time was too little too late for the Tigers. Peterborough Northern Star also lost 3-2 away from home after leading 2-1 with almost an hour gone through goals by Craig Smith and Bobby Bick. Wisebch were 3-1 losers at Northampton Sileby Rangers despite taking a fourth minute lead through Billy Smith. Division One champions Peterborough Sports were big winners at Irchester. They won 7-1 after an outstanding first-half performance that saw goals for Josh Moreman, Avelino Vieira (3), Jordan Macleod (2) and Dan Clements. Vieira’s hat-trick took his tally for the season to 36 goals. Blackstones lost 3-0 at Stewart & Lloyds.